OMEGAFLEX ® latex tubing features superior flexibility and elasticity, maintaining its shape memory even after repeated stretching. No coagulants or fillers are added to the tubing material, which minimizes migration into your fluid. 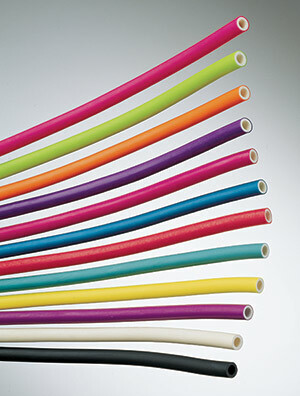 This natural latex tubing has 0.87% trace sulphur. Values listed are typical. Field testing should be performed to find the actual values for your particular application. Note: Contact Sales for color options. 4000' minimum order on custom colors. 참고: Values listed are typical. Field testing should be performed to find the actual values for your particular application. Contact Sales for color options. 4000' minimum order on custom colors. Minimum continuous length: 6 feet.